Most global markets recovered in the last three weeks of October from the sharp drawdown of the previous six weeks. Equity, commodity and credit markets continued to slide in early October with bonds rallying and recovering from their September losses. After a spike in volatility and sharp declines in global equity markets, the spark for recovery was a comment from St. Louis Fed President Bullard that the Fed should consider extending its bond purchasing program (QE) until inflation expectations show signs of stabilizing (for more, see here). The last three weeks of October saw a sharp rebound in equity markets, a modest rebound in credit markets and no rebound in commodity markets. Despite Bullard's musings, the Fed announced on October 29 that it was ending QE as planned and actually sounded a little more hawkish than anticipated. This may have been because the Fed knew that on October 30, US 3Q real GDP growth would be reported at a stronger than expected 3.5% annual rate. Then on October 31, the Bank of Japan provided a Hallowe'en treat by unexpectedly adding another large dose of QE stimulus. The US dollar strengthened again versus major currencies, including a 0.6% gain against the Canadian dollar. Energy prices weakened further as the WTI crude oil futures price fell to $81/bbl at the end of October down from $91/bbl at the end of September. Global equity ETFs were mixed. US small cap equities posted the strongest gains. Eurozone equities posted the largest losses. Global government bond ETFs, both nominal and inflation-linked, posted solid returns in October, despite giving up some gains in the final week of the month. Gold and commodity ETFs posted further losses. US GDP growth for 3Q was stronger than expected at 3.5%, while Canada is on a sluggish 3Q pace of just over 2%. There were further signs of weakness in the Eurozone and China. Global disinflationary pressure continued to build as energy and other commodity prices fell. Central banks remain on divergent paths, with the US Fed ending QE and preparing markets for a policy rate hike in 2015; the BoE softening its stance an on early rate hike; the ECB continuing to ease policy with liquidity injections; and the BoJ significantly increasing its QE program by announcing additional purchases of JGBs, equities and REITs. The Bank of Canada dropped its forward guidance of being neutral as to whether its next policy move will be a tightening or an easing but Gover Poloz, worried about the impact of lower oil prices on Canadian growth, still shows no intention of tightening ahead of the Fed. The S&P500 closed October at 2018, surpassing the previous record-high of 2011 reached in mid-September. Global equity ETFs were mixed in October, led by US Small Cap stocks (IWM) which rebounded a stunning 9.1% in CAD terms. Japanese equities (EWJ) gained 3.1% in CAD terms, with more than the entire gain coming on October 31 when the BoJ delivered its surprise easing. US Large Cap equities (SPY) gained 2.8% in CAD terms while Emerging Market equities (EEM) gained 2.1%. The worst performing equity market was the Eurozone (FEZ) which lost 3.0% in CAD terms. Canadian equites (XIU) lost 1.3% in October, reflecting declines in oil, gold and other commodity prices. Commodity ETFs posted further losses. The Gold ETF (GLD) lost 2.4% in CAD terms, while the GSCI commodity ETF (GSG) was down 5.3%. Global bond ETFs posted gains in CAD terms. The strongest returns in October (bolstered by the 0.6% appreciation of the USD versus CAD) were in USD-denominated Emerging Market bonds (EMB), which returned 2.6% in CAD terms, and US long government bonds (TLH), which returned 2.5% in CAD. EM Local Currency Bonds (EMLC) returned 1.9%, Canadian Long Government bonds (XLB) posted a 1.2% return and Non-US government bonds (BWX) gained 0.4% in CAD terms. Inflation-linked bonds (ILBs) also posted positive returns in October. US TIPs (TIP) gained 1.6% in CAD terms; Non-US ILBs (WIP) returned 1.0% and Canadian RRBs (XRB) returned 0.3%. Corporate bonds provided solid returns in October. US investment grade (LQD) and high yield (HYG) bonds returned 1.9% and 1.7% respectively, in CAD terms, while Canadian corporate bonds (XCB) returned 0.8%. In the first ten months of 2014, with the Canadian dollar depreciating 5.6% against the US dollar, the best global ETF returns for Canadian investors in CAD terms were in US long-term bonds (TLH), US large cap stocks (SPY), and USD-denominated Emerging Market bonds (EMB). The worst returns were in commodities (GSG) and Eurozone equities (FEZ). Canadian equities, which were the top performers through August, dropped back in year-to-date (ytd) performance as commodity prices fell again. In global equities, the S&P500 ETF (SPY), returned 16.5% ytd in CAD terms, while US Small Cap stocks (IWM) returned 15.6%. The Canadian equity ETF (XIU) returned 11.2% ytd. Emerging Market equities (EEM), despite two rough spells this year, returned 7.7% ytd. The Japanese equity ETF (EWJ), after weakening in October, returned 6.0% ytd in CAD terms, with virtually all of its gain coming in a single day on October 31. The Eurozone equity ETF (FEZ), which had been the top performer through May, continued to suffer from geopolitical tensions, stagnant growth and EUR weakness and returned -1.7% ytd in CAD terms. After strong starts to the year, commodity ETFs have performed dismally in the second half. 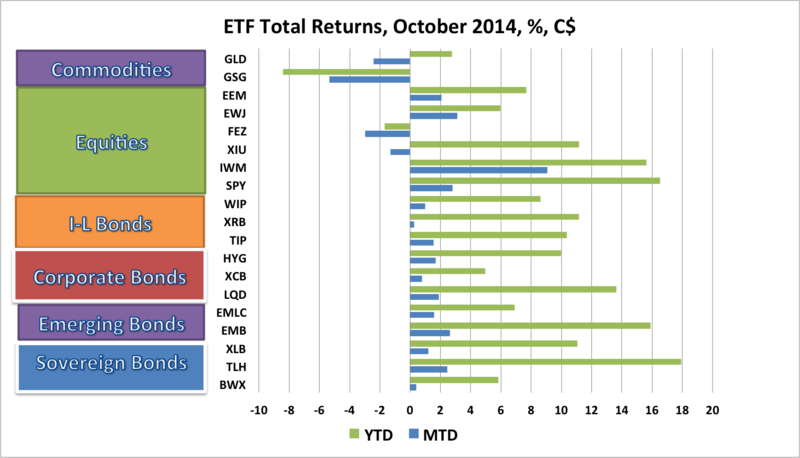 The Gold ETF (GLD) has returned 2.8% ytd in CAD terms, while the GSCI commodity ETF (GSG) returned -8.4% ytd. Global Bond ETFs rebounded in October after their early September selloff. Foreign bond ETFs have benefited from a combination of weaker than expected global growth, weakening commodity prices, safe haven demand and accommodative central bank policies. The US long bond ETF (TLH) returned 17.9% ytd in CAD terms, while USD-denominated Emerging Market bonds (EMB) returned 15.9% ytd. The Canada Long Bond ETF (XLB) posted a gain of 11.0% ytd. Emerging Market local currency bonds (EMLC) suffered from EM currency weakness to return 6.9% in CAD terms. Non-US global government bonds (BWX), also hurt by currency weakness, posted a return of 5.8% ytd. Inflation-linked bonds (ILBs) regained some lost ground in October and continued to turn in strong year-to-date gains after a disastrous performance in 2013. The Canadian real return bond ETF (XRB) has benefitted from its long duration, returning 11.2% ytd. US TIPs (TIP) returned 10.4% in CAD terms, while Non-US ILBs (WIP) returned 8.6%. In corporate bonds, the US investment grade bond ETF (LQD) returned 13.6% ytd in CAD terms, while the US high yield bond ETF (HYG) posted a return of 10.0% as high yield spreads have widened. The Canadian corporate bond ETF (XCB) returned 5.0%. In October, the Global ETF portfolios tracked in this blog posted varying gains, reflecting their different asset mixes. Returns on all of the global ETF portfolios have been boosted substantially by the weakness of the Canadian dollar. 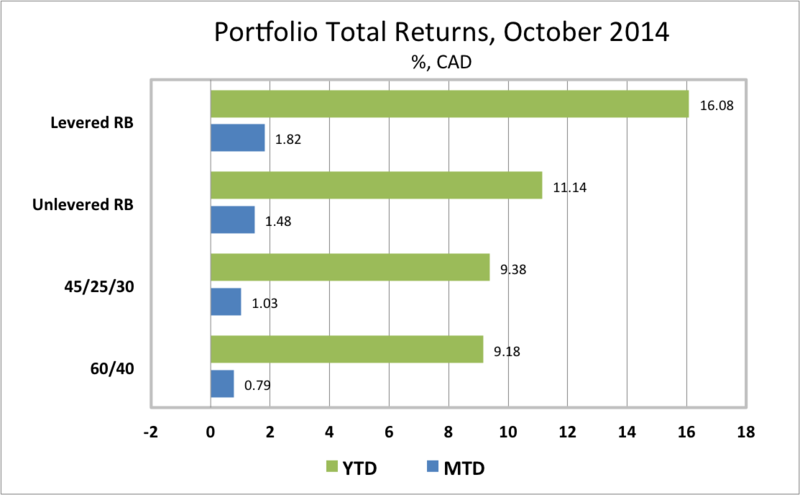 The traditional Canadian 60% Equity/40% Bond ETF Portfolio gained 79 basis points in October after losing 103 basis points in September and was up 9.2% ytd. A less volatile portfolio for cautious investors, comprised of 45% global equities, 25% government and corporate bonds and 30% cash, gained 103 bps in October after losing just 52 bps in September and was up 9.4% ytd, moving ahead of the 60/40 portfolio for the first time this year. The performance of the 45/25/30 Portfolio has validated our recent recommendation of holding ample cash. It has been the best performing portfolio since the end of August when the market correction began. Risk balanced portfolios rebounded from their September losses and remained the best performers for the year to date. A Levered Global Risk Balanced (RB) Portfolio, which uses leverage to balance the expected risk contribution from the Global Market ETFs, gained 182 bps in October after losing 136 bps in September, and was up an impressive 16.1% ytd. An Unlevered Global Risk Balanced (RB) Portfolio, which has less exposure to government bonds, ILBs and commodities but more exposure to corporate credit and emerging market bonds, gained 148 bps in September after losing 71 bps in September to be up 11.1% ytd. US labor market developments remain a key focus. With its October 29 Statement, the Fed has begun to prepare markets for a normalization of the policy rate in 2015. US employment growth has averaged just under 250,000 per month since April and the unemployment rate has fallen to a cycle-low of 5.9%. Another strong report is expected on November 7 and with the timing of a Fed rate hike now clearly "data dependent" any significant surprise will set the tone for the post-QE3 era. Growth in Europe is stagnant and Germany has experienced a sharp drop in industrial production. German IP is expected to have seen a partial rebound in September when data is released on November 7. The day before, the ECB is expected to announce further monetary easing, but to stop short of sovereign bond purchases. After the BoJ's surprising boost to monetary stimulus, markets will be watching for additional signs that the economy is rebounding from its sharp 2Q contraction that was induced by an increase in the consumption tax. Growth in China is weakening. The October manufacturing PMI was weaker than expected, falling back to 50.8 from 51.2 in September. A property slump and a slowdown in business investment has China on track in 2014 for its slowest growth since 1990 (for more, see here). The divergence in growth trends and central bank policies has continued to push the USD higher against all currencies. This trend, while clearly justified, is likely to have significant consequences in the months ahead. First, it will dampen US import prices which along with lower oil prices will tend to depress US inflation pressures. Second, it will potentially weaken S&P500 earnings for those companies with significant foreign operations. Third, it will potentially reduce the need for early Fed tightening. The Bank of Canada has dropped its forward guidance that it was neutral on the direction of the next policy rate move. However, this does not mean that the BoC is in any greater hurry to raise its policy rate. Canada's real GDP is on track to undershoot the BoC's 3Q projection of 2.5% and BoC Governor has expressed concern about lower oil prices weakening Canada's growth prospects. Further weakening of the Canadian dollar will be tolerated. Global disinflation/deflation concerns remain firmly in place. Weaker growth in the Eurozone, China, and other emerging economies, falling crude oil and corn prices, and the dampening effect of geopolitical tensions on consumer confidence all add to global disinflationary pressures. The risk of a global deflationary shock still seems much greater than the risk of a sharp increase in inflation. In recent monthly reviews, I have concluded that, “Having ample cash in the portfolio remains a good strategy until the unstable disequilibrium of weak growth, low inflation, accommodative central banks and stretched asset valuations is resolved.” In mid-October, as the market correction reached its nadir, some of that cash was put to work in US high yield bonds and some was put to work in Canadian high-dividend equities. Government bonds only look attractive if deflationary forces continue to mount. US equities, having rebounded to record highs, still look expensive. Consequently, maintaining ample cash in portfolios continues to look like the prudent approach.